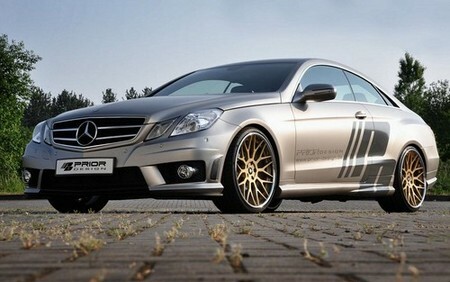 Prior’s next kit benefits the owners of the Mercedes E Class Coupe by providing them with a touch of AMG styling. The Coupe gets E63 front bumper, side skirts, rear bumper with integrated diffuser and four tailpipes, as well as carbon fiber roof and tail spoilers. Those who are not aware can easily mistake it with an official AMG product. But then the golden rims will spoil it! Those 20-inches are great wheels, only the finish is a bit uncool. Prior can also boost the output of the E500’s engine to 388 hp and 530 Nm of torque if you are willing to spend even more dough.